This post contains affiliate links, meaning if you purchase a product from this post, I may make a small commission at no additional cost to you. Thank you for supporting Seersucker Sass blog. Has anyone else been experiencing crazy weather lately? My skin is definitely feeling the effects of experiencing a snowy Monday followed by a mid-60’s Thursday and the heat and air conditioning that come with. Plus, there’s something about cold weather that makes me eat all of the things I shouldn’t be eating, leading to even more stress on my skin. Because of all of that, I’ve started paying more attention to my skin and trying to create a consistent routine, instead of just grabbing whatever I feel like out of the medicine cabinet and layering it on my skin. If you’re in the same boat and just want your skin to chill out and be normal again, today’s post is for you. I’m sharing six products that keep my skin in the best condition it’s seen since high school. My skin is combination oily, but most of these products are great for all skin types. IT Cosmetics Confidence in a Cleanser ($28) • Most of my makeup is IT Cosmetics, and I received some deluxe skincare samples with my last order. 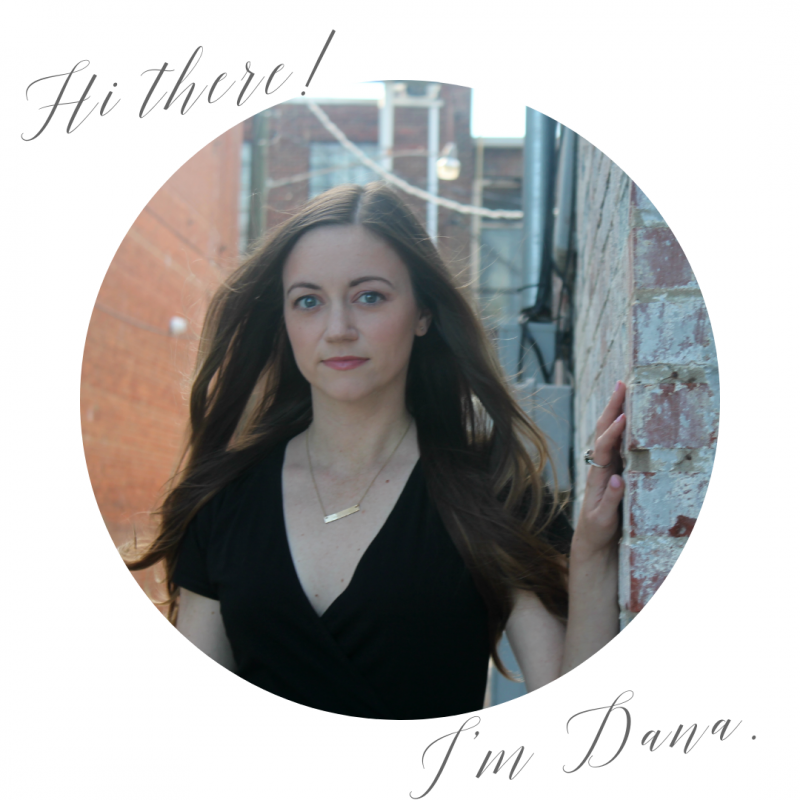 My skin was not adjusting well to the seasons changing, but the IT Cosmetics Confidence products completely turned my skin around. This cleanser contains all the good stuff – collagen, hyaluronic acid, and a ceramide complex. IT Cosmetics Confidence in a Cream Super Moisturizing Cream ($48) • This moisturizer complements the cleanser really nicely. It’s the thickest moisturizer I have ever used, which made me really nervous since I have combination oily skin, but it’s the first time in a few years that my skin hasn’t gotten dry and patchy. Note – If you’re interested in purchasing these products, QVC has a deal where you get the cleanser, moisturizer, eye cream, foundation, and foundation brush for $100 (including shipping), which is only $24 more than if you purchase just the moisturizer and cleanser. Clinique Moisture Surge 72 Hour Auto-Replenishing Hydrator ($19) • I use this on days when I need something lighter. The gel texture soaks right into my skin and makes a great base for applying makeup. Like the products above, it also contains hyaluronic acid. Young Living Lavender Essential Oil ($25) • I use lavender oil for a lot of things, but one of my favorite uses is on blemishes. It works faster than any other products I’ve tried, and unlike other products, it doesn’t dry my skin out. Mario Badescu Glycolic Foaming Cleanser ($16) • This product uses glycolic acid to exfoliate your skin, instead of using something gritty, messy, or abrasive. I use this three times a week, and I definitely notice a difference in the pores around my nose and on my chin. If you only purchase one item on this list, give this one a try! 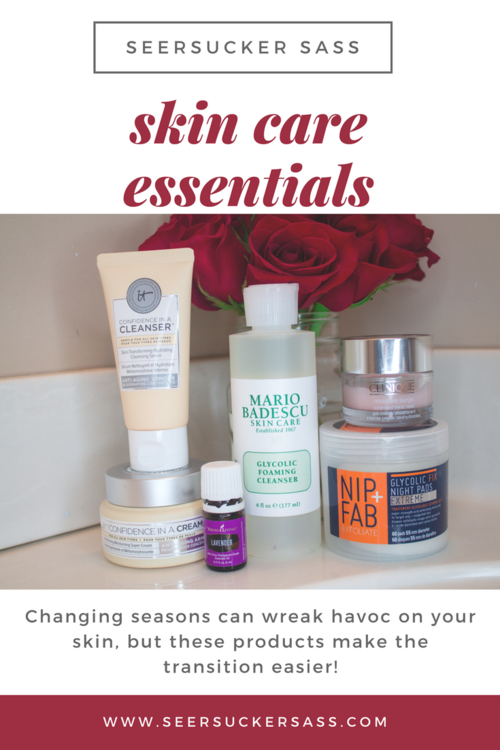 I want to hear from y’all – how do you keep your skin in check when the seasons change? Any products I should try? Mario's stuff has been AMAZING for my skin! I love their buffering and drying solution for my acne! I have yet to try It or Nip+Fab but I keep hearing amazing things about both brands! I have a sample size of the Confidence in a Cream and really like it- -I might have to buy the full-size and try the cleanser too! My routine is super simple! I used Burt’s Bees cleansing oil, a rose water toning spray and a moisturizer with SPF before heading out! I really need to start taking better care of my skin – I'm going to check all of these products out! 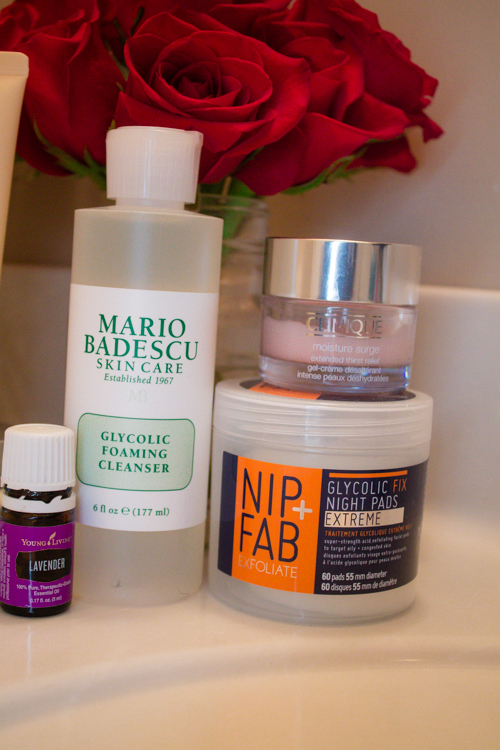 ooooh, I want to try those Glycolic patches! My skin gets so itchy and dry in the winter. These products look really nice for this issue and I should really give them a try! Wait wait wait lavender essential oil for blemishes? GAME CHANGER! That's my favorite essential oil but I didn't know about that!! !